French doublebassist, Pascale Delache-Feldman was a prizewinner at the Prague International Chamber Music Competition and was hailed by the New Music Connoisseur as having “technical certainty and musical imagination” and by the Phoenix as “ a gifted colorist.” An avid chamber musician, she has collaborated with violinists Midori and Joel Smirnoff, pianists Virginia Eskin and Randall Hodgkinson, the Borromeo, Lark and St. Petersburg String Quartets and soprano Dawn Upshaw. She has soloed with the Merrimack Valley Philharmonic, North Shore Philharmonic, Greensboro Festival Orchestra and has recorded on Albany, Archetype, Arsis, AFKA and CRI. Co-founder of Cello e Basso with cellist Emmanuel Feldman, they have concertized in the US and Europe where they toured in France, Germany, Austria and Hungary. Their first CD was released in 2002. 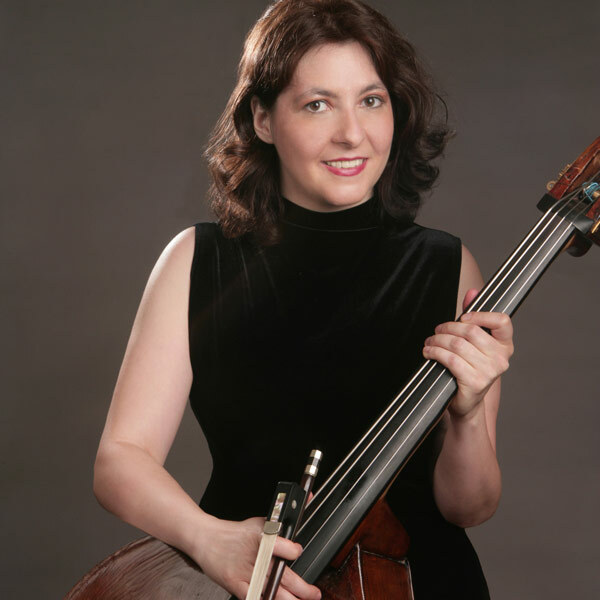 Ms. Delache-Feldman has performed with the Boston Symphony, Boston Pops, Toulouse Capitole National Orchestra (France), and as principal bassist with Metamorphosen Chamber Orchestra. A second-generation bassist, she studied with her father Jean-Claude Delache at age 10 at the Toulouse Conservatory, later studying with Jacques Cazauran and Frédéric Stochl at the Paris Conservatory where she earned a first prize with honors. Ms. Delache-Feldman came to the US to study with Roger Scott at the Curtis Institute of Music, where she received her Artist Diploma. Founder and artistic director of the Boston Bass Bash, an international festival dedicated to the doublebass, she is on the bass faculty at the Longy School of Music of Bard College, New England Conservatory, Rivers School Conservatory, Brown and Tufts Universities.